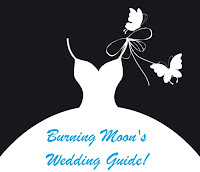 Burning Moon's Inside advice: The Bridal Flower Review! We aren't going to be having the most traditional wedding but I knew I still wanted a beautiful bouquet to go with my dress so I set out to find one that matched. Many of you may recognize the name of the sponsor for this review and that is because they are one of the sponsors of my Wedding Prize Pack giveaway which can be found Here, Don't forget to enter! 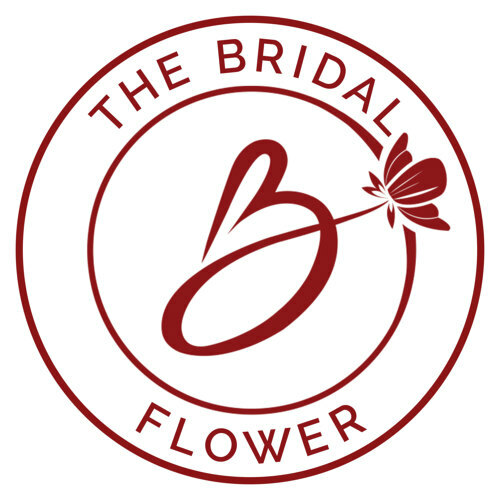 The Bridal Flower recently finished their brand new website and I love how everything turned out, they make it so easy to find exactly what you're looking for. When I spotted the Malibu Calla Lilly bouquet I knew it was the one, it has one of my favorite flowers and it isn't overly large I just wanted something sweet, simple and to the point. 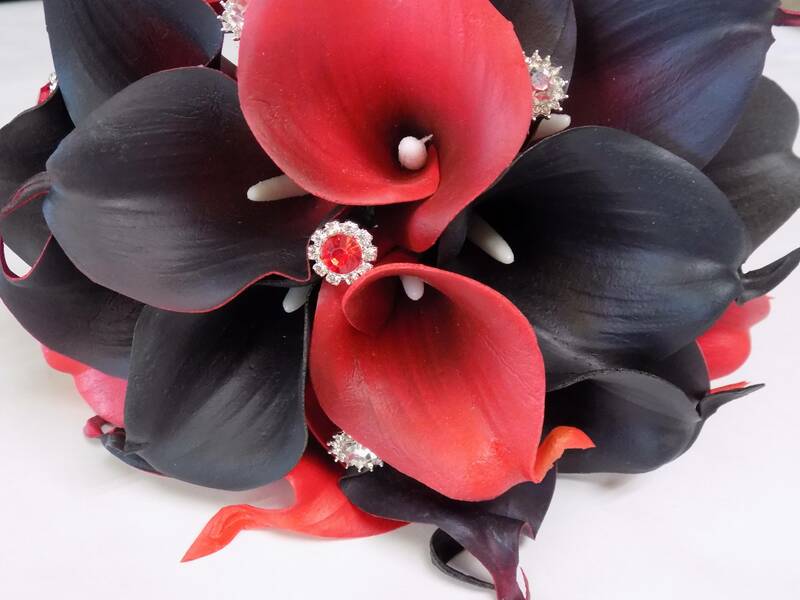 The Malibu Calla Lilly bouquet features twenty real touch calla lilies along with several small matching gem stones and either a satin ribbon handle or a "full bling" handle. For my bouquet she created one in my wedding colors which are red and black, with a matching handle that fits in perfectly with the feel of our wedding. The flowers look and feel like they are real but they aren't so you won't need to worry about the flowers dying or looking off at your wedding and it will last for many years to come. 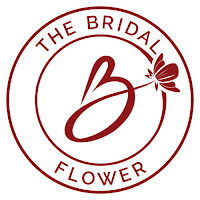 The bouquet is light weight yet feels sturdy in your hand, and even if you lay it on it's side you don't need to worry about the flowers being smashed because they will keep their shape due to the material they are made from. The flowers feel like they are made from a cross between a thin foam and leather which leads to it feeling like a real flower and it even looks like a real flower. The materials used have no scent to them so you won't have to worry about any kind of chemical smell from the materials the flowers are made from which is a big bonus. This bouquet fits into your hands perfectly, it can be carried one handed or two handed without any issues and it looks absolutely fantastic. I am very happy with how the bouquet turned out and shipping was not only speedy but packaged well so everything arrived in one piece. This bouquet can be bought for $84.99 with a satin ribbon handle, if you message the store owner I am sure she would be happy to make any bouquet in your wedding colors. I love the colors and details. They look real. I don't really like lilies because I am hugely allergic but these I could handle since they are artificial. Very beautiful!My daughter would love this bouquet. Beautiful just beautiful. Love the colors. These are so very very beautiful. A lot of talent making flowers that gorgeous. Omg! I love love love the colors ! beautiful ! Simply lovely. My daughter had calla lilies for her wedding. I just love them. I've never seen them in anything other than white. That bouquet is absolutely beautiful! I like that it is made to it lasts for years. Oh my, so much gorgeousness! Absolutely beautiful and unique. I am in love with this bouquet! I'm not usually a calla lily fan but holy moly,these are gorgeous! I love that you can keep it forever. My wife thinks this would also look great in fall colors. That is really gorgeous. The colors, the shape and the flowers go together perfectly. Oh those colors are amazingly beautiful! I wish I could have found something like this for my wedding 14 years ago! These are really nice. It isn't the usual which make them all the more special and a great find.